The next cute blogg design for cake and cookies blog, Ranggachoco. The Ranggachoco's owner request a cute design with soft purple color, I combine plain purple with tartan background pattern so it looks more cheerful. She also request header graphic of her family, she and her two kids with cake and cookies at the kitchen. Also a custom blog logo of Ranggachoco. A little detail of sidebar title background. Also share button on every post. 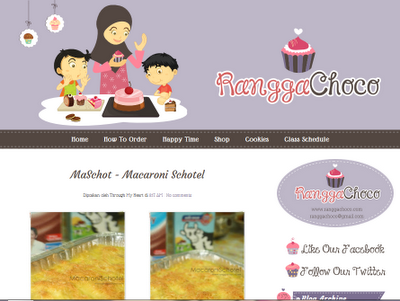 What do you think about this choco blog design? Lovely theme design!Looks simply cool! !